Modern Loft In Boutique King Street Building. Polished Concrete Floors, 10′ Ceilings, Open Ductwork, Huge Balcony With Gas Line For Bbq. Parking & Locker Included. Amazing Kitchen With Large Island, Bosch Dishwasher, Gas Stove & Convection Oven. Solar Blinds Throughout. Upgraded Laundry Appliances. Huge Walk-In Closet In Bedroom. Large Den. 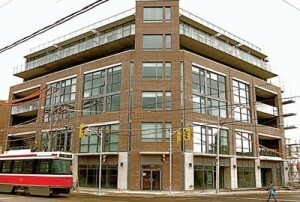 In The Heart Of Corktown District, Streetcar At Doorstep. Steps To Distillery District, St. Lawrence Market & Riverside. Don Valley Parkway In Less Than A Minute. Access To Fitness Centre And Party Room At 510 King Street East.